Bergerac is a substantial town on the banks of the river and with an extensive medieval old town. One of our favourite towns! The Chateau de Bourdeilles consists of a medieval defensive castle and a Renaissance castle in the pretty village of Bourdeilles. Visit the Chateau de Bridoire, a medieval chateau with lots of games for all the family. The Chateau de Commarque is an imposing ruined castle that was 'found' in the forest and has now been cleared and opened to the public. 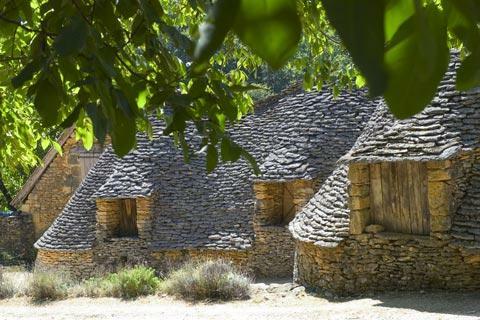 The picture-postcard village of La Roque-Gageac is along the banks of the Dordogne river and also has semi-tropical gardens and ancient cave dwellings to see. Molieres is small but perhaps the best example of an unspoiled bastide town in the region. Monpazier is an exceptional 13th century bastide town, among the most beautiful villages in France. Sarlat is the historic capital of the region, and perhaps the most remarkable and intact historic town in France. Highly recommended! The Grotte du Grand Roc is a beautiful natural cave system in the Dordogne. Villages classified as "most beautiful villages"